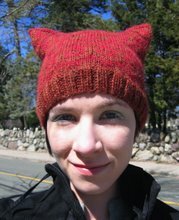 I find that I knit a whole lot more for others than I do for myself. Yes, it's great to go into a Job and say, "Oh, this sweater? Yes, I designed and made it last week." Looking fabulous and demonstrating quantifiable Skill are very, very satisfying. "LOOK AT ME!!! Not only am I gorgeous and fashion-forward, but I also have SKILL! Observe the Skill!" But not as satisfying as watching someone else unwrap something I've made. In order to give myself and these other people this type of satisfaction this holiday season, we'll see if I can finish up all the stuff in various stages pictured here... some is done and blocked, some is well underway, some is yarn. 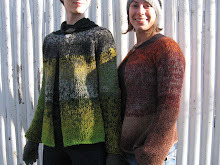 Reading blogs and talking to other knitters, I know that many other knitters' family members do not wear handknits. I think this would make me sad. There's nothing like a rabid Dud talking about how often he wears the sweaters I've made him and how there's just no time to wash them. He just can't go without for the time it takes the thing to dry. Or Chris asking me nicely for a "series of short socks" that he can wear with shorts in the summer and while bicycling and getting moderately upset whenever he sees me knitting a sock not intended for him. Or friends flipping through knitting pattern books when they come over and putting Post-Its on the pages of designs they particularly like. On the other hand, I would have time to make myself some socks. Or get those two submissions out that are due this month. Perhaps I would complete a commissioned thing or two. 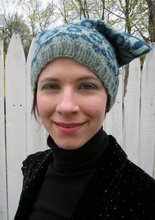 Or write down some more patterns from the things I designed and knit up years ago. Nah, I like Doing It for other people. I have the rest of my life to write up patterns. Thanksgiving was an excellent spread, and, for the first time in the history of my jobjobs, I have the day after Thanksgiving off and PAID. I took the Thanksgiving table opportunity for some Christmas knitting, around and around and around. Goal: two sweaters' worth by Christmas, plus a the smaller stuff, you know. Today I give thanks for the Law & Order Marathons by the glow of which I have been knitting, and dear New Job and its Paid Day Off. What are you thankful for? It's Christmas knitting time, people. 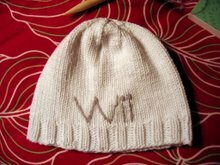 Unfortunately, the people for whom I'm knitting read this blog, so I'll be creating content from other side projects and past knits. Take, for example, The Chris here, ready to bike to the gym yesterday. Filey from Alice Starmore's Fishermen's Sweaters, a completed Shackleton Hat (my own design) from my handspun, fingerless gloves of my own design, and even handknit socks from some Socks that Rock in Lagoon. I didn't have to dress him up, either... I just caught him all dressed up before we left! It's appreciation like this from Weaver-Bergh family members that has made me undertake the massive Christmas push that I have. Yep. Sat around all day today and watched an entire season of America's Next Top Model while knitting and weaving madly and feeling neurons shrivel. In other news, we saw No Country for Old Men last night. If you like nihilism with your nihilism, head out and see it! Personally, I'm a huge fan of Cormac McCarthy and the Cohen brothers, so this was one of the best movies I've seen... ever? Maybe ever. and to watch the weather out the window of my Gasthaus. Comfort is found in the fact that I returned to New Job, even though I have been rather inept and slow these past few days due to jetlag (22 hours of travel on Sunday via cab, train, larger train, flight to Philadelphia, flight to Boston, retuning at 9:30 pm. Hmmm). So far, New Job is Good Job. Hooray!!! Oh, and here's a closeup of the knitting on the table in the picture above. I was mad to think I would finish this by Christmas. But the beauty... oh, the beauty. Check this out on Thursday at 9 am and Saturday at 10 am. Yes, I finished the crazy project from my previous post. The inspiration was here. Click on the thumbnails. That's what I'm talkin' about. My sister Beth wanted in on this action, so the SCARF will go in the mail to her next week. 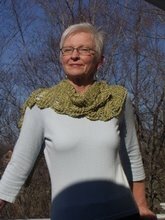 Last weekend I completed a new sweater, the details of which I could not photograph in daylight until today. Behold, the World Series Sweater, which, aside from the very top portion, was all knit during Red Sox/Indians and Red Sox/Rockies games. 1. Knit slowly. Relax. The Red Sox will do just fine without all your worrying. 2. Keep the rounds right on the floor by your feet, so you're pulling the ends pretty much straight up toward the knitting. Too much of a diagonal and they will split every few feet. 3. Be sure to swatch first and wash and block your swatch. This will reassure you about the softness and durability of your final product as well as give you correct gauge. 4. 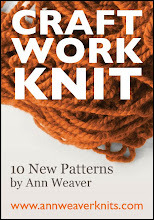 Really, knit slowly. Big motions. Relax. 5. Spit splice when you're yarn falls apart. This is a sign that you are not sufficiently relaxed. The positive of this yarn? Well, it has a great halo, and is exceptionally warm and light. SUPER warm and light as a feather. And it has this awesome floatiness. I highly recommend it. Oh, and this is a faux cardigan; the buttons in front are tacked into place. Do not think you can make buttonholes in unspun yarn, since they will shred apart after just a little in-and-out button action. I made a back pleat to match the front button detail. The buttons are antique mother of pearl, gotten from the same estate sale at which I purchased my Loom to End All Looms. 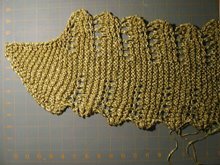 A row of single-crochet around the neck (done in Evila 2/8 in the color of the unspun; yes, I do have a lot of stuff from Wollsucht) gave some much-needed stability. I LOVE IT! 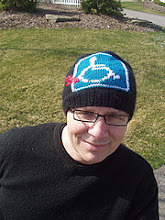 Friday's knitting was swatching: this is Dream in Color Worsted in Black Parade. Oh baby. It's going to become a Classic sweater for a Christmas recipient, which means not too much detail here until after the new year. Oh well. Go buy some of this yarn. I mean, look at it, all deep purple and bottle green and deep grey in the sunshine, how could you say no?